Corzine to play Two-Face in new Batman! [Corzine] has also has emerged as a key lobbyist against proposed rules that would have restricted firms such as his from, among other things, borrowing customer money to make investments. Those rules Boys & Girls, are part of the same Dodd-Frank reform law Corzine "supported"! Weird coincidence: Senator Chris Dodd and Congressman Barney Frank, whose names top the regulatory bill Corzine sought to undermine, were also offered the role of Two-Face (one half Dodd, the other Frank) due to their star turns in Housing Bubble: The Monster that Ate Wall Street. Both turned it down. Citing their busy schedules as financial reformers. 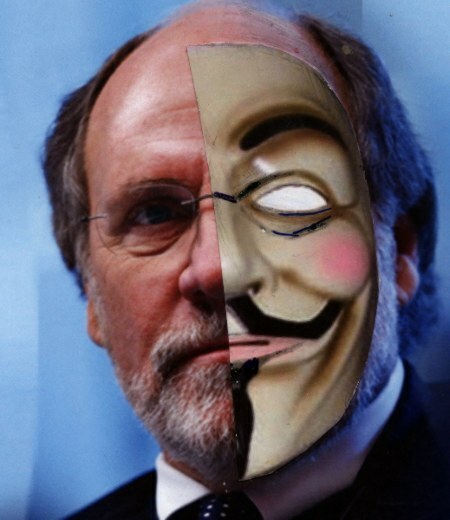 Though not first choice as Two-Face, Corzine jumped at producer Uslan's offer. Snapping back "Mister, I was made for it." Demonstrating his film savvy by channeling Tyrone Power as the master con turned chicken-chomping geek in the classic noir, Nightmare Alley. Talking pop culture history, the original Two-Face, as created by DC Comics in the 1940s, was a good guy gone supervillain wrong. Two-Face was once Harvey Dent, the reformer district attorney of Gotham City. But Dent goes bonkers after a criminal tosses acid on him, hideously deforming one side of his face. Dent embraces his "Two-Face" and becomes a crime boss. Fans who've followed Corzine's political career know he too once appeared a reformer. In 2000, he shelled out $62 million for the role of senator from New Jersey in Mr. Corzine Goes to Washington. It was a short run; in 2005, Jersey's political bosses on the D side cast Corzine as governor. Many in the voting audience believed the wealth Corzine garnered as former chairman and CEO of Goldman Sachs (1994-99) would make him immune to sleaze. The myth of the gazillionaire political savior rides again. Hope springs eternal, even in Jersey. Reviewers gave Corzine a Golden Turkey . Past is past. Big things are happening here & now for Jon. Thanks to the sudden collapse of MF Global, the mysterious disappearance of roughly $600 million of its customer funds, and the possible co-mingling of customer and company money (a regulatory no no), Corzine will now be starring in a series of federal and state investigations, plus civil litigations produced by some of the hottest firms in the biz. Corzine has hired Andrew Levander, a former assistant U.S. attorney to help him handle the load. Levander's celebrity clients have included John Thain, Merrill Lynch’s former boss, and Ezra Merkin, a former associate of Bernie Madoff. Right before MF folded like a cheap Goldman, Jon Corzine was spotted on Wall Street bundling mega campaign donations for President Obama-- in hopes of replacing crony capitalist superstar Tim Geithner as Treasury Secretary. (Imagine the boffo box office if MF Global had tanked after Corzine was appointed!) While bundling, Corzine sported full frontal Two-Face. Knowing his fellow players would dig the ironic Lon Chaney. Though the Treasury appointment is now gone with the wind, don't cry for Corzine. Being in a Batman beats hanging with the too-big-to-fail. And if the Bat doesn't fly, there's always the circus. Buzz sez the geek routine is making a big comeback. New twist; biting the heads off free range chickens. (First you gotta catch 'em.) And my buddy Buzz is always right about trends. *Trivia: Corzine's illustrious co-stars at Goldman included his protégé, mortgage banker and bond trader Kevin Ingram. After racking up mega losses at Deutsche Bank in 1998, Ingram went on to star as a money launderer for a B movie bunch of Jersey-based terror plotters. **More trivia: the film version of Bret Easton Ellis' American Psycho starred pre-Batman Christian Bales in the title role. Think Bruce Wayne, through a glass darkly. Copyright (c) 2011 by Carola Von Hoffmannstahl-Solomonoff. This material may be freely distributed subject to the terms and conditions set forth in the Open Publication License. This license relieves the author of any liability or implication of warranty, grants others permission to use the Content in whole or in part, and insures that the original author will be properly credited when Content is used. It also grants others permission to modify and redistribute the Content if they clearly mark what changes have been made, when they were made, and who made them. Finally, the license insures that if someone else bases a work on this Content, that the resultant work will be made available under the Open Publication License as well.